Assembly needs more time as it leans towards change in abortion law. The Citizens Assembly appears to be leaning towards a change in Ireland’s abortion laws. The Citizens Assembly appears to be leaning towards a change in Ireland’s abortion laws. The chair of the Assembly said a “heavy burden” had been placed on the 99 volunteers as they discuss the matter. Ms Justice Mary Laffoy said the group would sit for an extra weekend due to the complexity of the issue. The Assembly’s work is now expected to be completed in mid-April. It will then feed back into the Oireachtas for further direction. It was envisaged the highly divisive issue would be explored over four weekend sessions of the Assembly. But at the close of the January meeting in Malahide Ms Justice Laffoy said it had agreed to timetable an extra weekend. The Assembly, which is hearing evidence in public sessions from a wide range of experts and interest groups, has been deluged with more than 13,500 submissions on the matter. 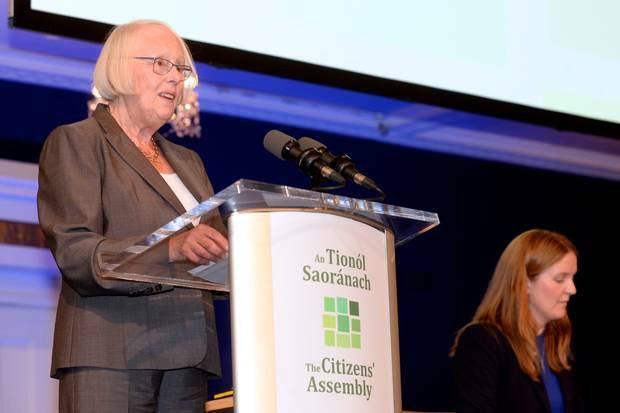 During this weekend’s meeting, it appeared the Citizens Assembly is leaning towards change in the abortion laws. One member said her table felt Ireland’s abortion legislation “was not fit for purpose”.Another spoke of mental health issues, feeling the Eighth Amendment was “too restrictive, degrading, prohibitive and inhumane”. Another said the amendment should be repealed. The 99 Assembly members were chosen at random from across Ireland and their views on abortion were not known in advance. One said the constitution “should continue to represent the rights of the unborn” while others said “clarity was needed” to direct GPs and so that their personal beliefs did not take precedence. Others wanted to know more about the consequences of repealing the Eighth Amendment. Those opposing abortion in Ireland said they were concerned about the prevalence in Iceland of the termination of foetuses with Down syndrome. The Assembly heard no baby had been born with Down syndrome in Iceland for the past four years since DNA tests had been widely introduced for pregnant women. But the overall tone of the viewpoints expressed will concern the Pro Life Campaign, which said the Assembly was “given an impossible task by the Government from the outset”. “It is nonsensical to expect us to consider 13,000 submissions over a weekend or two, then report back to the Oireachtas with well argued and carefully considered recommendations. It won’t happen,” said Assembly spokesperson Cora Sherlock. Ms Justice Laffoy later announced that Assembly meetings would be extended. She spoke after a private discussion was held with members. Among the questions put to the group were whether Ireland now needed to regulate abortion, whether rules and standards would have to be adopted, and how would regulation be effected. Ms Justice Laffoy said, although the assembly meetings would be extended, “it was important to note this does not affect my previous commitment to complete the work in respect of the Eighth Amendment within the first half of 2017”. “I am determined to deal swiftly and comprehensively with this matter,” she said. In Ireland, a pregnancy can be terminated under the Protection Of Life During Pregnancy Act if there is a risk to a woman’s life, including suicide. The procedure can involve a medical or surgical termination or an early delivery by induction or Caesarean-section. Figures from the Health Service Executive showed 26 terminations were carried out under the legislation in 2014 and the same number again in 2015. In both years, 14 arose from a risk to the life of the mother from physical illness, three in relation to suicide and nine following emergencies arising from physical illness.